The Marching Storm lead a parade down Main Street USA playing "You're a Grand Old Flag"
As is their tradition, the SVHS Marching Storm took their quadrennial trip to Orlando, Florida during the week of June 4 to perform at and visit the parks at Walt Disney World. 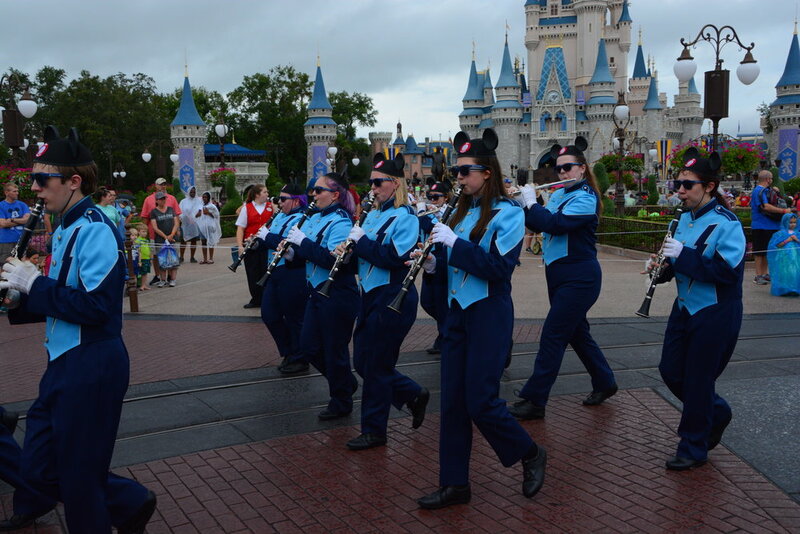 Since the mid-1980s, our band has continued to be invited to march in a parade at the Magic Kingdom, as well as work with a professional Disney musician in the backstage area for a clinic. During the clinic, students learn about the music performance and industry careers. In addition to their learning and performance opportunities on the trip, students also got to enjoy some much-deserved time in each of the parks, including Magic Kingdom, Hollywood Studios, Animal Kingdom, and Epcot. Mr. Gorecki would like to thank the students for their excellent behavior during their travels, and the parents and teachers (Mr. Scanavino and Coach Hargrove) who gave up their time to chaperone the trip.